Portugal has a high national debt owing to government actions during the financial crisis of 2008. The difficulties experienced by the country’s banking sector required state intervention. This intervention in turn, led to a government debt crisis, which was sorted out with the help of the IMF and the European Union. The government has endeavoured to repay these debts. However, by the end of 2017, the Republic of Portugal had a debt to GDP ratio of 125.6%. This is the IMF’s calculation of gross national debt. That organization’s estimate of Portugal’s net national debt to GDP ratio was 108% at the end of 2017. The IMF focuses on “general government debt,” which is all of the money owed by all levels of government in the country. The OECD estimates the national debt to be “public debt,” which expresses all of the money owed by the entire public sector. This figure reached a debt to GDP ratio of 146.3% at the end of 2017. 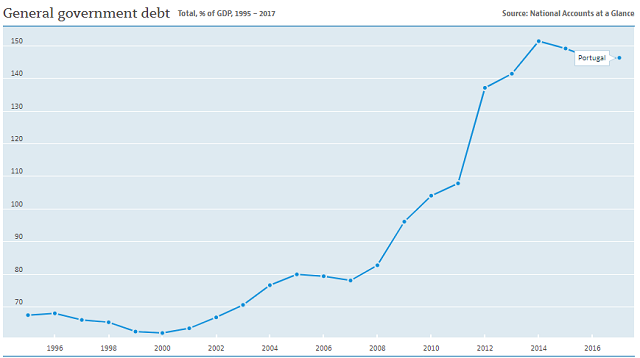 The chart below from the OECD shows the rate of increase in Portugal’s debt to GDP ratio. The rate has been on a generally upward trend for the entire 20 year period shown in this graph, but the growth in debt escalated between 2008 and 2014. 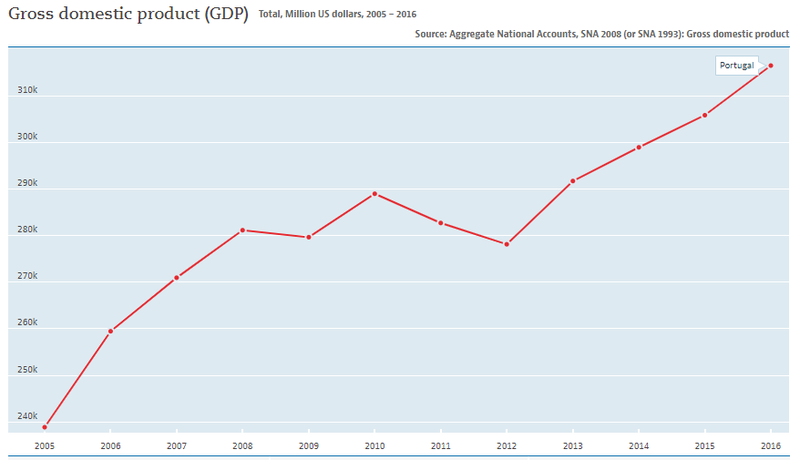 Why did Portugal’s national debt to GDP ratio escalated? Given that Portugal got help to reorganize it finances from the IMF, you may wonder why the debt to GDP ratio continued to rise all the way up to 2014. The reason for this lies the other side in the debt to GDP ratio calculation: GDP. The government’s debts peaked in 2010 at 149 billion Euros and then continued to fall through to 2012 when they got to 130 billion Euros. The debt level stayed around the 130 billion Euro mark until 2015, when it rose back up to 149 billion Euros. Before 2008, the Portuguese government had been running high budget deficits in order to pump money into the economy and promote GDP growth. When the country needed a bailout, that government pump priming stopped. Not only did the Portuguese economy suddenly experience a loss of economic stimulus, but the flow of cheap loans offered by the country’s banks also stopped dead. This resulted in a reversal in GDP growth. GDP continued to decline because as well as the removal of easy credit and excessive government spending, the economy had to deal with the effects of bankruptcies. The ripple effect of a recession takes time to work its way through the financial system and express its impact on the nation’s income. In addition to the damaging effects of a sudden economic reversal, the higher borrowing taken on by the government did not provide income generating benefits. Rather, the cost of servicing the assistance loans that the government received required the Treasury to extract even more money from the economy to pay higher interest and make capital repayments. Removing money from the economy to repay debts caused the country’s GDP to fall further. So, as the GDP of Portugal fell, the country’s debt to GDP ratio rose, even though the absolute amount of that debt was decreasing. Who manages Portugal’s national debt? The Ministério das Finanças, or Ministry of Finance, is responsible for overseeing Portugal’s national debt and is answerable to the nation’s parliament. The task of managing the debt is implemented through a government agency, called Agência de Gestão da Tesouraria e da Dívida Pública, translates to Portuguese Treasury and Debt Management Agency. The Agency uses the abbreviation “IGCP, E.P.E.” to describe itself. The remit of the IGCP, E.P.E. doesn’t just extend to raising loans. The agency also has to think of ways of reducing the cost of Portugal’s national debt. After the country hit a crisis in 2008/2009, international traders were unwilling to buy Portuguese government securities, so a large part of the assistance that the IMF gave to the country was in the form of a loan. Since the country’s debt profile has stabilized, it is possible for the Agency to raise funds for the government through issuing bonds. The interest that the Agency offers on these bonds is lower than the interest on the IMF loan. So, the agency has decided to pay off the IMF loan ahead of schedule in order to reduce debt servicing costs. By 2017, the country had paid off about 60% of that expensive IMF loan. However, that repayment didn’t reduce the country’s overall debt level because debt raised through bonds replaced the debt to the IMF. Wherever possible, the Agency also engages in bond buybacks and replaces the debt that they represented with new commercial bonds at a lower interest rates. These higher rate bonds that are being retired are those held by various EU assistance funds and the ECB. So the Agency is gradually replacing the debt held by supranational institutions with bonds held by traders. How does the Portuguese government raise loans? The IGCP, E.P.E. focuses its debt raising activities on the issuance of Treasury bills and bonds. It does not take out bank loans. Bills and bonds are sold off in auctions. However, these primary issuances can only be bought by a circle of approved institutions. This group is called the “Primary Dealers.” Another institution that wants to buy a large allocation of bills or bonds has to contact one of the Primary Dealers and get it to act as an agent at the next auction. The primary dealers my tender for a portion of the instruments that are on offer at an auction. Not all of that allocation will be accounted for as agency contracts with other buyers. When a primary dealer does not sell its allocation directly to its clients, it places those bills and bonds up for sale on the secondary market. The secondary market for public debt in Portugal is called the Mercado Especial de Dívida Pública (MEDIP). This market is based in Lisbon, but it is an electronic platform, so those who buy and sell on the market can be located anywhere in the world. What government securities does the Portuguese government sell? Treasury bills are commonly used by all governments for short-term financing. These devics never have a maturity of more than just short of one year (one year minus one day). In Portugal, Treasury bills are called Bilhetes do Tesouro (BTs). The BTs don’t pay any interest, but they are sold at discount and redeemed at full face value. The auctions of BTs can only be attended by a subset of Primary Dealers that are specifically allowed to bid on Treasury bills. This group is called the Treasury Bill Specialists (EBTs). The standard Portuguese government bond is called an “OT” — that stands for Obrigações do Tesouro. The OT is a fixed rate benchmark bond that has a maturity of one year or more, all the way up to 50 years. Bonds issued before 1994 pay interest in two six month installments. Bonds issued after that date get one interest payment a year. The Portuguese government also issues floating-rate bonds, which are called Obrigações do Tesouro de Rendimento Variável (OTRVs). The interest rate stated on the certificate is the Base Rate plus a margin, so the actual interest payable each year may vary. Interest payments are made semi-annually. What facts should you know about Portugal's national debt? You could wrap $1 bills around the Earth 1,197 times with the debt amount. If you lay $1 bills on top of each other they would make a pile 33,583 km, or 20,868 miles high. That's equivalent to 0.09 trips to the Moon.